Reality check: has your little one recently had a serious growth spurt? Time to say goodbye to all those cute outfits in pastel colours. Sad? It is anything but! Now that your little one is growing, it is time to find out together which style really suits him or her. And because at NOP we know that each child is a unique individual, we offer a wide variety of children’s clothes in sizes 104-152. Discover your child’s style with the distinctive NOP collection! NOP is for unique kids. For tree climbers and rowdy characters, but also for curious kids and the ones eager to learn. And for the quieter ones, of course – the dreamers. The sustainable designs by NOP are characterised by distinctive artwork and a perfect fit. This allows your child to stand out from the crowd and be their true self in a comfy way. 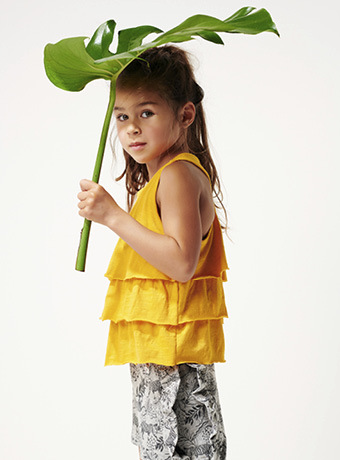 The cheerful, graphic prints mixed with a sometimes bold touch perfectly match the age of carefree play. From girly to cool – At NOP we know that every child is a unique individual. That is what we have taken into consideration when we developed our cheerful and surprising collection. 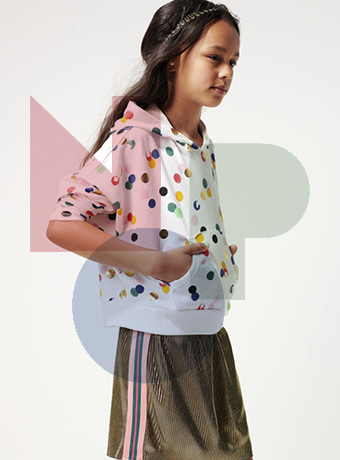 Emphasise the distinctive character of your girl with one of the cheerful outfits by NOP. Hello statement!